Posted on September 27, 2016 at 11:47 am. Sign in at Leo Vegas Casino between September 22nd and October 24th, or if you’re new, register here to claim your 200% welcome bonus plus 200 free spins to use on selected pokies. Play any casino game for real money and for every $10 you wager, you’ll receive one entry ticket to the major prize draw, plus one point that goes towards securing your position on the weekly leaderboard. You can earn double points by playing any of the pokies in the NetEnt Rocks trilogy (Motörhead, Guns N’ Roses and Jimi Hendrix) on your desktop, or triple your points by playing these three games on your mobile. Play at the live dealer Leo Vegas Celebrity Blackjack Party table, and any time you receive an ace of spades, you’ll get one additional entry to the major prize draw. 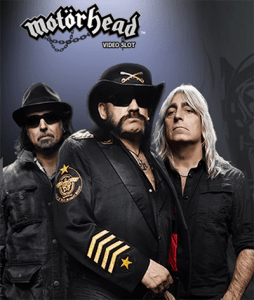 Join the Rock Festival at Leo Vegas Casino today and play the new Motörhead pokies game for your chance to walk away with some epic prizes. If you’re new to Leo Vegas, remember to claim the 200% matched deposit welcome bonus, plus receive 200 free spins to use on selected slot games.